Hi Joanna! How would you normally be chatting with friends? Suits me fine! Let's be there virtually. Tell us a little bit about yourself. I run Adventures and Tea Parties, which is a handmade brand and creative lifestyle blog. I am also a freelance blogger for Simple Stylish Makes, The Kettle Shed and a writer and photographer at This Is Your Kingdom. Wow! Busy lady. I love the item you are sharing. Can you tell us more about it? This is called the Love Birds Handkerchief, which I sell in my online shops. I make it out of 100% cotton and embroider the motif entirely by hand. I designed the motif by drawing and re-drawing it to get it right. I really like the symmetry of the design. 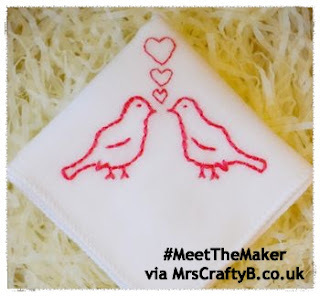 How and when did you learn the skills you have used to create the Love Bird Handkerchief? I’ve been sewing and embroidering since I was a little girl but only really got back into sewing about 10 years ago when my flat mate got a sewing machine for her birthday. I had a go on it and was hooked all over again. Before I knew it, I had got myself my own sewing machine and was constantly at the local fabric shop. It was only in the last 5 years that I started embroidering on to fabric and designing my own motifs, which I love! I’ve been practising ever since and also doing lots of reading about techniques. Having an online shop really encourages me to improve my skills in order to make beautiful products, which people want to buy. It depends what craft I’m working on. If I’m sewing or embroidering, then I work in my studio with the radio on. If I’m knitting, then I do that in the living room, usually while watching a film and sipping on tea. I love a bit of crochet or knitting on the sofa. What is your favourite craft? I think it has to be knitting because I find it very relaxing and it’s portable too, so I can take it anywhere with me. I like little projects I can pop in my bag for long car journeys ha ha. Great minds think alike *winky face*. So do you have any crafting tips? 1) Test your tension out on a scrap piece of the fabric you’re about to start sewing with. Get that tension right before beginning a new project. 2) Wash fabric first to pre-shrink it before sewing. It’s so disappointing when your finished garment shrinks in the wash! 3) When embroidering, use no more than approximately 30cm of thread. Too long a piece of thread can result in knots. Great tips! You'll have to share your sewing tips posts with the #CraftyBs group on Facebook! Where will they be able to find you online? My Blog, on Twitter, over on Facebook, Instagram, Pinterest, Bloglovin’ and Google +. Do you have any big plans for the next 12 months? I’m currently making some big changes to my online shops, with a load of new products and better photography. As well as that I’m updating my blog layout and expanding my business. I’ve also got some exciting news coming soon but I can’t share that just yet! Ooooo you tease! Well do come back and update us! Ok lastly, A quick fire round just for fun. Claire from Claireabellemakes. She does the best crafty DIYs and is always trying something new. She’s an inspiration! Cheese and biscuits (I don’t have a sweet tooth). A Cornish Sea Captain brooch by Katy Pillinger Designs. It has such character, is beautifully made and the design is truly inspired! I’m most happy being by the sea but also being close to a small city or town, with lots of independent shops. Brighton has that in buckets and is definitely a favourite place of mine. My friends and family, music and making things by hand (that can be anything from sewing to knitting to cooking or gardening!). Starting my own business from nothing and keep it going while facing horrendous problems outside of work. Your virtual space is beautiful regardless of whatever it is that you are facing offline. Well done you and thanks so much for sharing. I look forward to more sewing tips and seeing more of your lovely designs. That is so annoying isn't it. I hate it when I am forced to cut my threads because I have knotted them!